There are many times where we hear about the misfortune of others only to spend a moment thinking about how terrible it is and then, quickly dismissing the thought, we continue on with our lives. This past holiday season the patrons of the Chemung County Library District can say they got involved and helped out those less fortunate than themselves. As part of our Hogmanay celebration the district forgave fines for those who brought in food items that were collected and donated to the Food Bank of the Southern Tier. We are delighted to report that we collected a total of 381 food items which totals $1,905 in fines forgiveness. 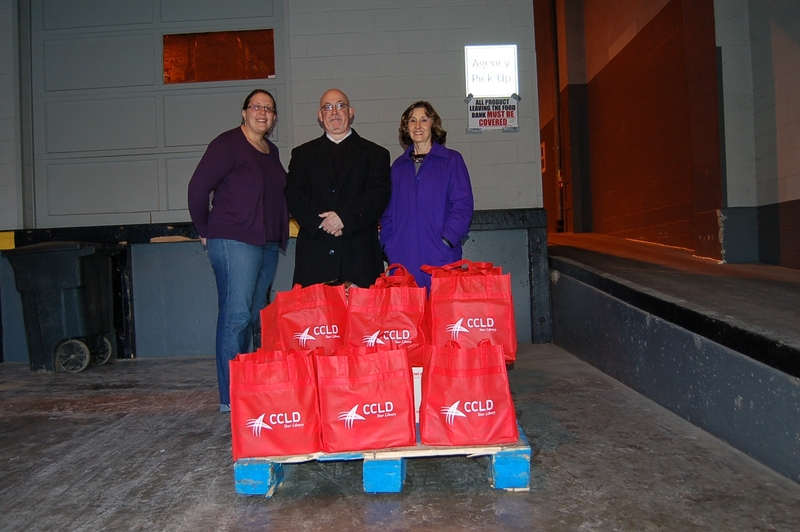 Melissa Knowles, Food Sourcing Manager for the Food Bank of the Southern Tier accepted the donation from CCLD Director Ronald Shaw and Librarian Chris Corter. This entry was posted in Community, Director's Comments, District News, Uncategorized and tagged donations, fines, food bank, forgiveness, Hogmanay by ccld. Bookmark the permalink. It’s nice to see the library supports body as well as mind in our community.